Deschutes Public Library proudly announces the 16th annual celebration of “A Novel Idea…Read Together.” Each year “A Novel Idea” brings together thousands of Deschutes County residents to read, discuss and attend a variety of free cultural and author events at the Library’s six locations and at partnering businesses. Programming begins April 6 followed by three weeks of programs that explore and expound upon the ideas found in the community read selection, Robert Kurson’s Rocket Men: The Daring Odyssey of Apollo 8 and the Astronauts Who Made Man's First Journey to the Moon. “A Novel Idea” concludes with a free presentation by Kurson on April 28. “A Novel Idea” has continued to grow year after year. When the program began in 2004, 600 people participated. Last year, nearly 7,000 people took part, whether it was checking out the book, engaging in a lecture or hands-on program, attending the author presentation—or, as is often the case, taking part in it all. The annual program is the largest community read program in the state of Oregon. “We’re excited to offer up a full range of out-of-this-world programs to enhance the readers’ experience and enjoyment of the novel,” says Liz Goodrich, lead project coordinator for “A Novel Idea.” “We’ll hear from an astronaut who flew six times on the Space Shuttle, explore how women in the 1960s contributed to NASA, enjoy art work inspired by Rocket Men, and hear from a physicist on the concept of spacetime. We also have fun hands-on programs: we’ll build and launch an old-fashioned bottle rocket and visit two local observatories. We of course include book discussions as well,” says Goodrich. The events culminate with a free presentation by Kurson on Sunday, April 28, at 4:00 p.m. at Bend High School. A book signing follows Kurson’s presentation. Tickets are required for the free event and are available on April 6 at www.dplfoundation.org or at any Deschutes Public Library. Reader’s guides are available at each of the public libraries in Deschutes County; a PDF version is also available online at https://bit.ly/2JkAzJo. New for 2019, the library also circulates book club bags to local book groups throughout Deschutes County. The bags include 10 copies of the book and discussion questions and are available for a two-week check-out. Book club representatives can contact Paige Ferro (541-312-1063 or paigef@deschuteslibrary.org) to reserve a book club bag. Robert Kurson’s Rocket Men shares the inside story of the dangerous Apollo 8 mission. In early 1968, the Apollo program was on shaky footing. President Kennedy’s end-of-decade deadline to put a man on the Moon was in jeopardy, and the Soviets were threatening to pull ahead in the space race. By August 1968, with its back against the wall, NASA decided to scrap its usual methodical approach and shoot for the heavens. With just four months to prepare, the agency would send the first humans in history to the Moon. In a year of historic violence and discord—the Tet offensive, the assassinations of MLK and RFK, the Chicago DNC riots—the Apollo 8 mission was the boldest test of what America could do. With a focus on astronauts Frank Borman, Jim Lovell and Bill Anders, and their wives and children, Rocket Men is a vivid account of the epic danger involved, and the bravery it took to leave Earth for the first time. Robert Kurson began his career as an attorney, graduating from Harvard Law School. His professional writing career began at the Chicago Sun-Times, where he started as a sports agate clerk and soon gained a full-time features writing job. In 2000, Esquire published “My Favorite Teacher,” his first magazine story, which became a finalist for a National Magazine Award. His stories have appeared in Rolling Stone, The New York Times Magazine, and other publications. His other books include Shadow Divers, the true story of two Americans who discover a sunken World War II German U-boat; Pirate Hunters, an account of two courageous divers and their quest to uncover the shipwrecked vessel of one of history’s most infamous pirates; and Crashing Through, the story of an entrepreneur who regains his eyesight after a lifetime of blindness. “A Novel Idea” is made possible by generous donors: Lonza Pharma & Biotech; The Roundhouse Foundation; RBC Foundation; Pacific Power Foundation; Oregon Arts Commission; Deschutes County; EH & ME Bowerman Fund at the Oregon Community Foundation; US Bank Foundation; Deschutes Cultural Coalition; The Bulletin; William Smith Properties; and our five Friends of the Library Organizations in Bend, La Pine, Redmond, Sisters and Sunriver. This program is supported in part by the Oregon Arts Commission, a state agency funded by the state of Oregon and the National Endowment for the Arts. All programs are free. No registration is required unless noted with an asterisk (*). 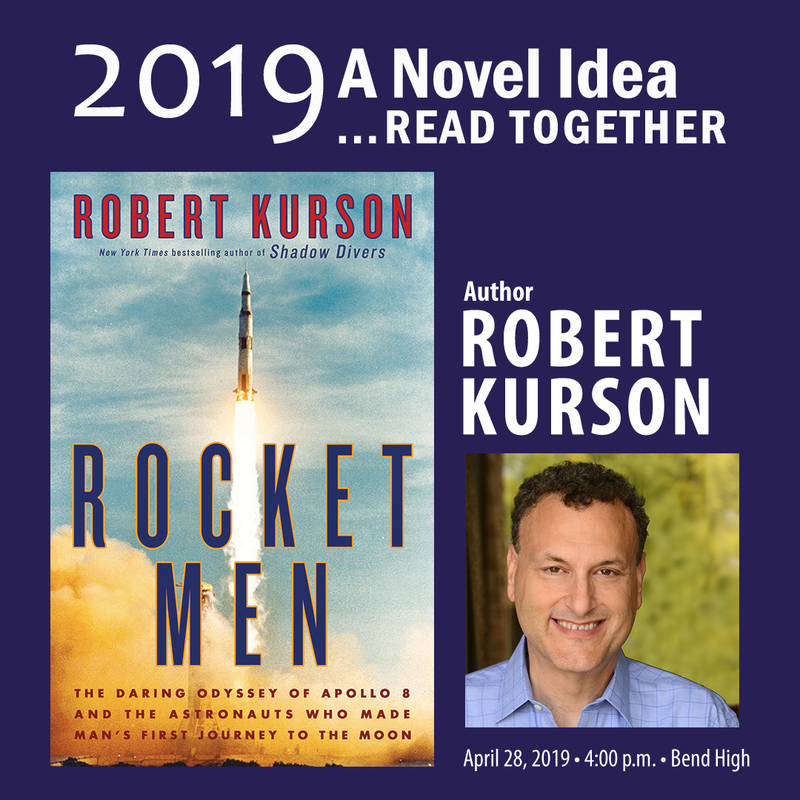 Deschutes Public Library welcomes Robert Kurson, author of Rocket Men, and the New York Times bestseller Shadow Divers to Central Oregon for the final event of “A Novel Idea ...Read Together.” * Tickets required; free tickets available April 6 at www.dplfoundation.org and at all Deschutes Public Library locations. Celebrate student artwork, inspired by Rocket Men, on display in the Barber Library rotunda on the COCC campus. Refreshments and live music. Art will be on display through May 2. Explore how women in the 1960s contributed to NASA and broke barriers along the way with Jamie Bufalino, instructor in the Departments of History and Women's, Gender, and Sexuality Studies at the University of Oregon. She has a doctorate in History specializing in the histories of gender, race, and sexuality in the United States with special emphasis on social movements and consumer culture. Central Oregon played host to astronauts preparing for the first lunar landing in the 1960s. In this talk, Laura Ferguson, the Curator of Western History at the High Desert Museum, explores the role Central Oregon played in the space program, as well as highlights what life was like for those living in Bend at the time. Learn the origin of the Moon from astronomical interpreter Tim Merrill. Merrill will discuss the most accepted scientific theory of the formation of our moon: the Giant Impact Theory. The Worthy Garden Club is co-hosting this event and allowing library patrons the use of the Hopservatory after the lecture. Space is limited and registration is required. As we mark the 50th anniversary of Apollo 8 we have the opportunity to recover histories that have been lost to the more popular historical account of the mission and the tumultuous events 1968. The discussion, led by Dr. Robert D Thompson, Jr. from Oregon State, will note how the “historical threads, hidden in plain sight” are linked to current movements of today, including #Black Lives Matter, Say Her Name, Moral Monday, and Standing Rock. Build and launch old-fashioned bottle rockets at Bend Science Station. The Bend Science Station provides high-quality, laboratory-based science education for more than 7,000 students and their teachers a year in Central Oregon. Space is limited and registration is required. Join Sing Bend’s Public (ROCK) Choir Sing-along, led by Deena Kamm, for a deep dive into the music of 1968 (with a few space-themed songs thrown in for fun) and belt out songs without feeling self-conscious or worried about who can hear you and who’s watching. Americans in 1968 endured one of the most tumultuous years in American history. The year began with the Tet Offensive, during which North Vietnamese troops invaded the heavily guarded US Embassy in Saigon and ended with the election of Richard Nixon in November. Americans were exhausted. Dr. William Rorabaugh from the University of Washington unpacks one of the most contentious years in American history. In this brief talk on the war in Vietnam, look in-depth at the origins of the conflict and the various parties involved. Professor Christoph Giebel, of the University of Washtingon, will relate the Vietnam War to the Geneva Accords of 1954, using one example from 1965 to illustrate how opposing sides in the 1960s used imagery and rhetorical frames to mobilize support for the costly war. Professor Giebel will look at the complex socio-political-military situation in the 1960s to reveal how representations of the conflict have tended to obscure realities of the conflict. In this talk, Cassio de Oliveira tells the story of how space exploration became a central concern of the Soviet regime. Over the course of four years, from 1957 to 1961, the launches of Sputnik-1, the dog Laika and astronaut Yuri Gagarin (respectively the first artificial satellite, the first animal in the Earth’s orbit, and the first human in space) astounded the world and came to represent the crowning achievements of the Soviet space program. Search the night sky for nebulae, galaxies, star clusters and planets at the “A Novel Idea” star party. The Oregon Observatory at Sunriver has the largest collection of telescopes for public viewing in the United States. What you’ll be able to see is dependent on the weather. The Observatory is open to the elements so please dress accordingly. For more information about A Novel Idea, please contact Liz Goodrich at (541) 312-1032 or lizg@deschuteslibrary.org. Explore the “A Novel Idea” website at www.deschuteslibrary.org/calendar/novelidea/ for event listings and author information.